Do you know the truth that information you erase by formatting your hard drive, or by using your computer's "delete" key is still easily recoverable? Never mind, unless you have PCTuneUp Free File Shredder, which is an advanced security tool for Windows that allows you to completely remove multiple files/folders saved in different locations of computer system by overwriting them several times with US Dod 5220.22-M erasure method. With this program, files deleted cannot be recovered by any third party software, even by special hardware devices. Do you think the files in your recycle bin are really being deleted? No! Just like any deleted file, the files that are deleted from the recycle bin are still there - just simply marked as free space. With PCTuneUp Free File Shredder, files stored in the recycle bin will be fully shredded with the simple steps, completely unrecoverable. This free file shredder provides 3 optional shredding methods including US Dod 5220.22-M erasure method, Gutmann method and quick delete method to shred your data in repeated times. Each one can fulfill your different deletion needs. PCTuneUp Free File Shredder is a secure file deletion tool. Think of money movements, original scripts, account passwords and, in general, all private data. This tool will wipe this information completely and effectively so that it can't be recovered, ever. Since deleted files are only marked as deleted, after some time your hard-drive's free space is not actually free - it contains lots of data. It takes up huge amounts of disk space, causes your computer run slowly, even gets recovered by someone. PCTuneUp Free File Shredder can help erase those unwanted files permanently that you no longer need to free up disk space and optimize system performance. 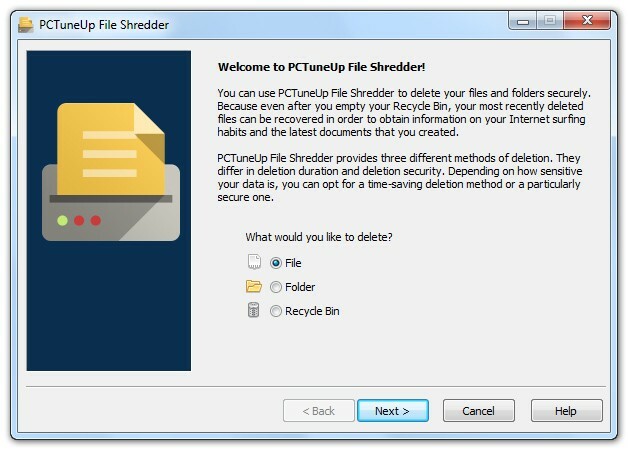 PCTuneUp Free File Shredder is quite easy to use. It allows you to just drag and drop the sensitive files onto the main program window of shredder to make them disappear forever. 2014-05-07 4.1.8 New version may include unspecified updates, enhancements or bug fixes.